This story was updated at 2:15 p.m. EDT. A space shuttle technician fell to his death this morning (March 14) from a launch pad at NASA's Kennedy Space Center in Cape Canaveral, Fla.
James D. Vanover, 53, a swing arm engineer for NASA contractor United Space Alliance, fell from an elevated level on Launch Pad 39A, where the space shuttle Endeavour is being prepped for launch, around 7:40 a.m. EDT (1140 GMT), the space agency said. He died shortly afterward. "NASA emergency medical personnel did respond but they were unable to revive the man," NASA spokesman Allard Beutel told SPACE.com. Further details were not immediately available. Beutel said NASA has begun an official investigation into the incident. "Our heartfelt sympathy goes out to the family of Mr. Vanover," said United Space Alliance chief executive officer Virginia Barnes. "Our focus right now is on providing support for the family, and for his coworkers. We are also providing our full support to investigating officials in order to determine the cause of the incident as quickly as possible." Following the accident, the space agency halted all work on Launch Pad 39A for the rest of the day and was offering counseling to its employees. "Obviously, at least right now, our focus is on the work force and the family members of the employee," Beutel said. "We're not doing any shuttle processing at the moment — definitely no work at the pad for the rest of the day." 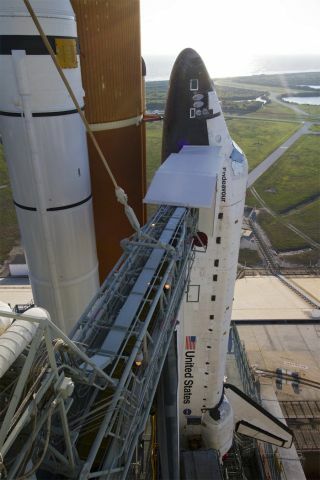 Endeavour is slated to launch April 19 on its final space mission before retirement. NASA does not expect today's incident to delay the launch. "We have about a week's worth of cushion in the schedule, so I would not anticipate it," Beutel said of the possibility of a delay, "but at the moment that's not our focus." The shuttle Discovery just recently landed after its last flight March 9. That orbiter delivered a new room and hardware to the space station. Accidents involving shuttle workers at NASA are rare but not unheard of. "According to information compiled by the U.S. Space Walk of Fame Foundation, an organization that serves to recognize the contributions of America's space workers, there have been four previous deaths from injuries at Launch Pad 39A," said Robert Pearlman, a board member of the foundation and the editor of collectSPACE.com. William Estes, a mechanic with the Bendix Corp., died in May 1968 after the iron cap to one of the launch pad's pressurized water supply lines struck him in the chest, Pearlman said. And another fatal accident occurred in March 1981, just before the very first launch of the space shuttle Columbia in April 1981. Rockwell technician John Bjornstad died on the pad after being exposed to gaseous nitrogen inside the aft compartment of Columbia, Pearlman said. Two of his co-workers, Forrest Cole and Nick Mullon, later died from complications related to the same exposure. "All three had been working to prepare Columbia for the first space shuttle launch," Pearlman said. And at least one previous worker died from a fall off a launch pad. In May 1981, Anthony Hill, a construction worker, fell 110 feet from Pad 39A's twin pad, 39B, at the Kennedy Space Center.